Membrane potential noise plays multiple functional roles in the nervous system, as described in the review by Faisal et al. Calcium-dependent potassium (KCa) channels are ion channels whose conductance depends on intracellular calcium concentration. Previous work by Diba et al suggests that such channels play a central role in subthreshold voltage noise . While most channels generate noise through their inherent thermal fluctuations, we hypothesize that KCa channels also generate low-frequency subthreshold oscillations by transmitting stochastic fluctuations in intracellular calcium. We have produced a stochastic computer model that incorporates KCa channels and calcium dynamics into a CA3 pyramidal neuron, which is based on the biophysically realistic Traub model . To introduce channel noise, we replaced all Hodgkin-Huxley (HH) channels with equivalent Markov models . There is also an intracellular calcium pool, with Ca2+ levels that vary stochastically due to influx through Markovian calcium channels. 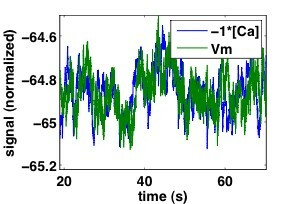 Preliminary simulation results show that, for the default parameters used by Traub, there is anti-correlation between intracellular calcium and membrane voltage (Figure 1); this suggests intracellular calcium fluctuations may partially drive low-frequency voltage noise. Additional modeling has implicated the Ca2+-dependent afterhyperpolarization current (IAHP) as the primary linkage between these two signals. 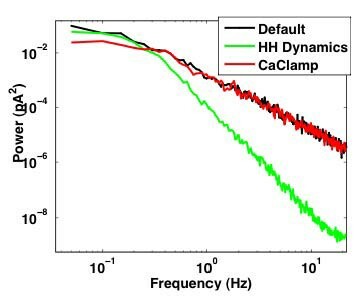 Power spectrum analysis suggests that the contribution of intracellular calcium fluctuations is dominant at low frequencies, below the natural cutoff for IAHP noise (Figure 2). We believe that this linkage between membrane potential noise and intracellular calcium could regulate many of the well-documented roles of noise in the nervous system . Power spectral density for stochastic I AHP current Black trace is simulation under default settings. Red trace shows the effects of clamping intracellular calcium, which reduces low-frequency power. Green trace shows the IAHP current when inherent thermal fluctuations are removed by switching channel dynamics from Markov to HH. The crossover of these two signals suggests that intracellular calcium fluctuations can contribute to low-frequency voltage noise.